Vasqscan is an economical 3D ultrasound carotid scanning, reconstruction, and display system that allows one to map, measure, and assess change in the characteristics of carotid plaque over time. Using a clinicians’ existing ultrasound system, Vasqscan is used to generate intuitive and quantitative 3D models of blood vessel structure through a combination of add-on hardware and processing system, and analysis software. 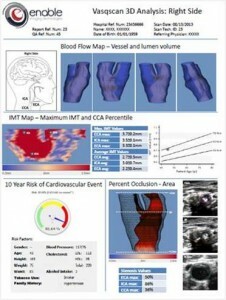 The result is a meaningful visual report of the state of the patient’s cardiovasculature that represents a balance of simplicity for patient understanding and quantitative metrics for the clinician. 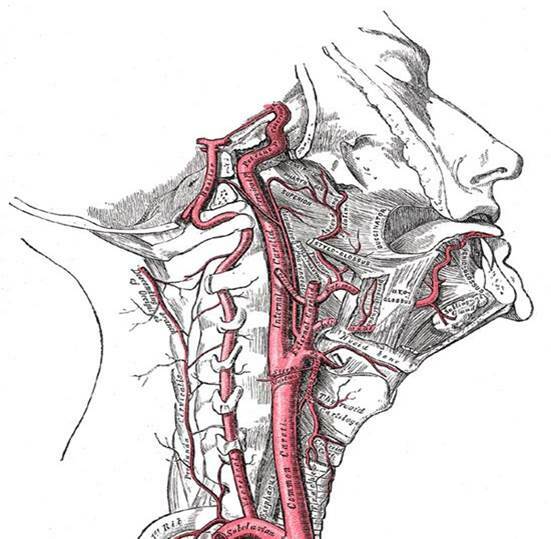 The carotid artery is a major vessel that transports critical blood from the heart to the brain. There are two of these vessels, one running on each side of the neck, just beneath the skin. As people age, and in response to genetic factors, stress, poor diet, and smoking, materials called plaque will begin to line the vessel and make restrict the path for the blood to flow to the brain. This can get worse over time and eventually lead to a stroke, or starving of the brain of blood. The carotid bulb is the y-shaped location in the neck where the main vessel called the CCA splits into the ECA to feed blood to the face and the ICA, which is one of several vessels that feed the brain. The bulb is a good location to understand how much plaque has accumulated in the vessel and how closed the vessel has become. A good picture of this location can give a good general indication of the overall health of all of the major blood vessels in the body, including the heart. Simple. The clinician secures their ultrasound probe into the Vasqscan hardware, lies the patient down, and performs a 15-second scan. 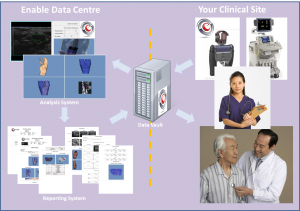 The data is automatically submitted to the Enable Tier IV Data Vault and the clinician can then move on to the next patient. Behind the scenes, the scan data is analysed using Enables’ proprietary algorithms and software, and run through four levels of human quality control to generate the 3D vascular report. 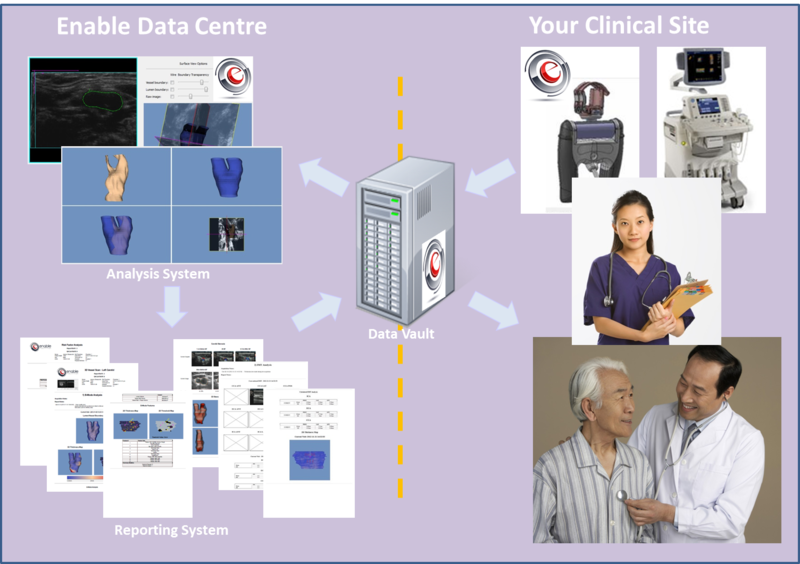 The final report, with full interactive 3D capability is then passed to the clinician or patient in web format or .pdf. Vaqscan reports are available in custom views, summary screening format, and full analysis format. Each form dynamically draws upon the analysis data to pass the information in a form that is intuitive to the particular end user. Features allow the reports to be displayed from our secure web-portal with ful 3D interactive objects on any HTML5-enabled web-browser or smartphone. Vasqscan has obtained SFDA regulatory approval for sale in China and is readily available in major centers. copyright © 2015 enable imaging technologies inc.